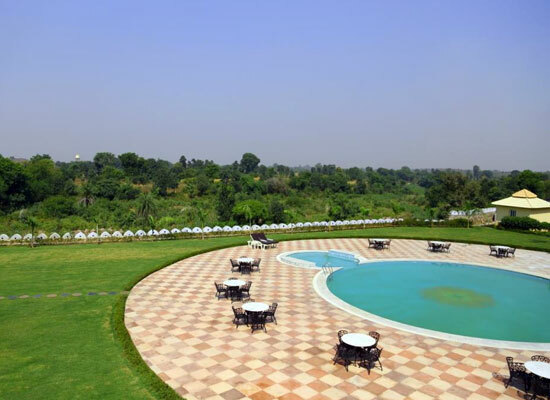 "Surrounded by acres of greenery, Raj Mahal is a contemporary boutique resort in Orchha that's inspired by the cultural and architectural heritage of its surroundings. 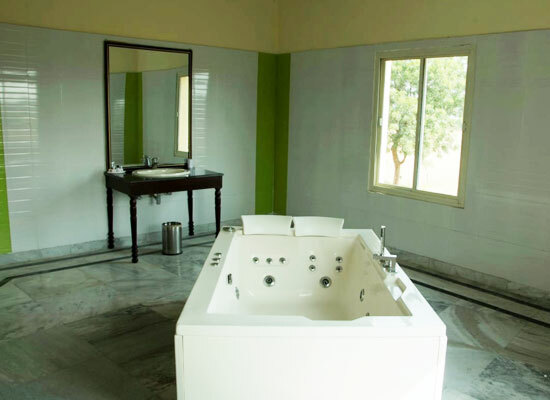 Located 5km from the Ram Raja temple, the resort is characterized by its relaxed environment, elegant interiors, beautifully landscaped gardens, Ayurvedic spa, outdoor pool and an in-house restaurant. From your balcony see the quadrant garden or swimming pool, or sit back and relax on the comfortable poolside deck chairs. Spend your evening enjoying the views from our terrace, while sipping a hot cup of tea. Raj Mahal Palace in Orchha is a place to enjoy the ultimate in luxury, a selection of refinement and privacy for the discerning guests. 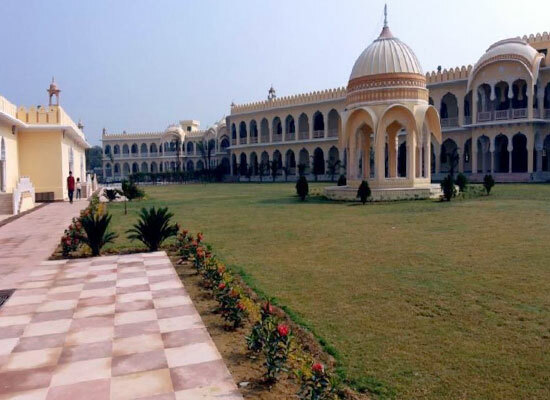 There are 41 deluxe rooms, 10 super deluxe rooms and 3 Raj Mahal Suites. The rooms are designed to provide elegance and comfort. 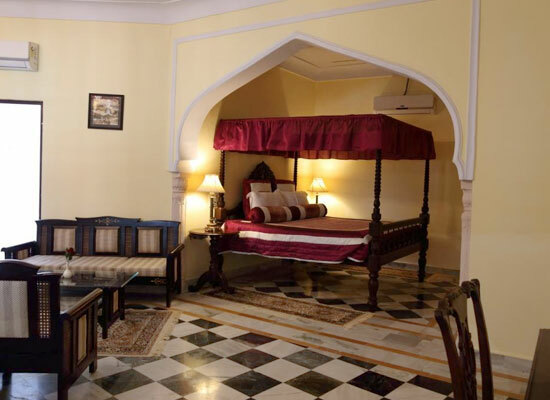 Redefining comfort, Deluxe Rooms are tranquil lodgings in the Raj Mahal. With a hoard of amenities ranging from the necessities to the luxuries, each of these rooms is well-resourced and becomes your very own comfy nook during your stay with us. Facing the lush green garden, our deluxe rooms open on to a cozy balcony, offering the perfect place to end a tiring day. Creating a new benchmark for serenity and comfort, the Super Deluxe Room is ideal for a big family. While the beautiful bedroom is perfect for a relaxed snooze, the terrace offers a panoramic view of the landscape and the open skies, allowing you to bask amidst the natural beauty that surrounds our property. Enjoy the spacious rooms and a bigger balcony. Also, you can choose a pool facing room if you like gazing at crystal clear blue hues. 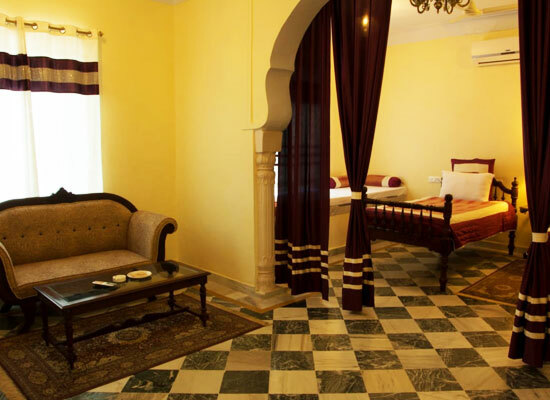 The grand suite at Raj Mahal Orchha is a fusion of Mughal decor with the contemporary design. From the plush decor, to a host of amenities the suite offers only the best. The foyer of the suite opens to a formal lounge with an adjoining dining room for 12 and all crystal items are imported. The balcony opens up to the view of the garden and swimming pool, surrounded by towering royal palms, a tranquil oasis in the city. Each room is tastefully furnished with a king-size bed or twin bed upholstered in the royal memories and equipped with all the modern facilities. 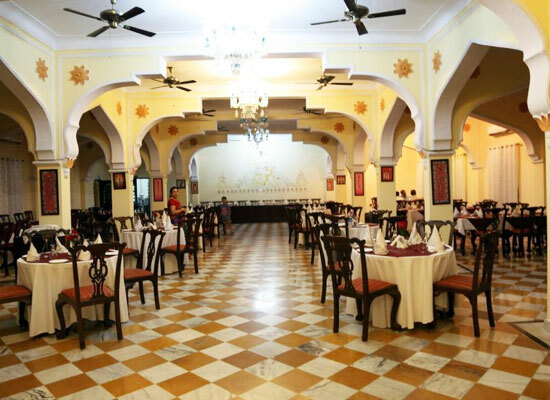 Classy restaurants, champagne lounge and bar each with their own distinct flavor, dining in Raj Mahal is a collection of contemporary Indian cuisine, fine Italian, pan Asian dishes while enjoying fine wine, Scottish malts, a champagne or high tea. Nestled on the serene banks of River Betwa, Orchha is a testament of the days of the Bundela Rajputs that once ruled here. The ancient town seems to be frozen in time and its monuments, ancient 16th century architectural marvels still retains its original grandeur. The fascinating structures, the charm of the bygone era.